Costume design for the ensemble members of the cast. The tattoos designed by Samantha Reed, Wig and Make-up Designer, based upon the stories about these disciples lives and deaths. 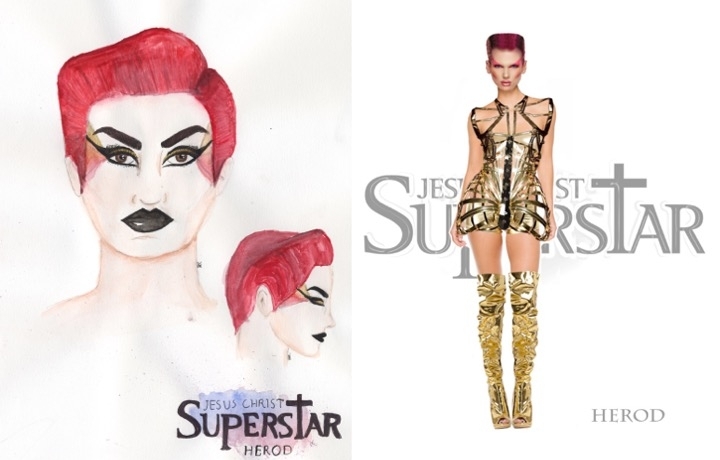 Samantha Reed's Wig and Make-up design with Kathryn Wagner's Costume design for their androgynous take on King Herod. Dave Nofsinger's Scenic Design inspired by rock concerts and megachurches. In class Wednesday, we spoke with the designers for University Theatre’s production of Jesus Christ Superstar, including: Patrick Cassidy, director (PM Class only); Kathryn Wagner, costumes; Samantha Reed, hair and makeup; Dave Nofsinger, scenic design; Costa Daros, sound; Matt Knewtson, lighting; Monique Robine, technical direction; and Kevin Abbott (AM Class) or Leah Barton (PM Class), projections. What surprised or impressed you most about the design process? Please be specific. What are director Patrick Cassidy’s concept for the production? Choose one technical element. How is this concept evident in this design element? After hearing the collaborative nature of musical theatre, as the designers enter into their technical and dress rehearsals, what challenges do you see for the designers over the next week based upon what you viewed in class today? Make a prediction as to how these elements will look on Friday, April 6, in performance. Besides Musical Theatre being a collaborative art form, it also utilizes numerous subject areas and professions in the course of meeting, designing, rehearsing, building, creating and putting on a production. What is your major and how do you see tasks/duties of your future career applied in musical theatre? Be specific. At the heart of all theatrical forms is storytelling. Choose one technical element that you believe will aid in telling the story. How will this element aid in telling the story of Jesus Christ Superstar? Why do you think this element is important? Compare and contrast the ideas learned in today's class with content from another class. What is the same? Different? This post opened Wednesday, March 28 at 6:45pm for Group C, last names M-Si. This post will be open until Sunday at 10 pm.